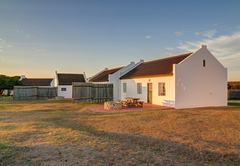 De Hoop Village is a highly recommended property providing self catering in De Hoop for tourists visiting the Cape Overberg region. 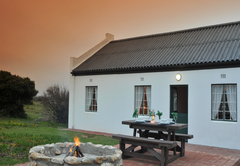 De Hoop Village offers accommodation in nine lovely cottages in De Hoop Nature Reserve. This World Heritage Site offers the finest whale viewing in Southern Africa. The Marine Protected Area, which extends five kilometres out to sea, is one of the largest marine protected areas in Africa, providing a sanctuary for a vast array of marine life. 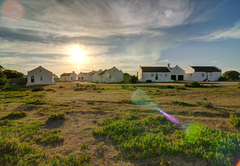 De Hoop Village at the Opstal offers nine stunning cottages each white washed, fisherman style houses. 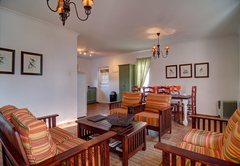 Each cottage sleeps six guests in three bedrooms. 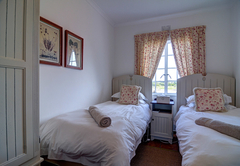 One of the bedrooms has a double bed or twin beds, the second room has two single beds and the third room has bunk beds. There is one bathroom with a shower and complimentary toiletries. 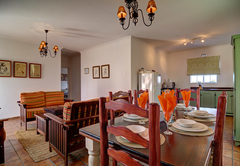 The cottages have an open plan living area and kitchen with a dining table. 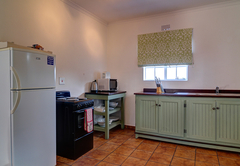 The kitchen has a kettle, toaster, fridge / freezer, stove / oven, crockery / cutlary etc. 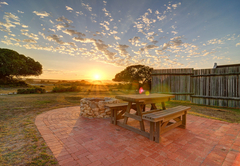 Situated in the Overberg region near the southern tip of Africa, this very special reserve is under three hours from Cape Town. 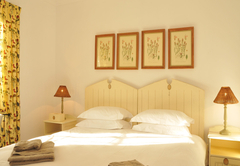 It is located near Arniston, Swellendam and the Breede River. Interpretative walks through the fynbos to the rock pools and guided bird walks are just some of the activities available, as well as whale watching and game viewing. The magnificent night skies lend themselves to star and constellation identification. Kitchen lounge / dining area; outdoor braai and dining area. 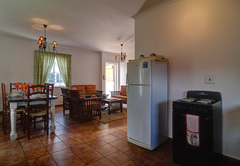 Amenities: Kettle; toaster; microwave; fridge/freezer; stove/oven; basic crockery and cutlery; basic kitchen utensils; sink (dish washing liquid & sponge provided); braai equipment. 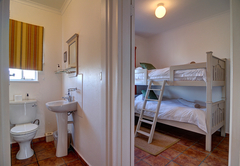 3 Bedrooms: 1 double room (either twin or double bed); 1 twin room & 1 bunk room. Linen and hangers provided. 1 Bathroom: Shower; basin; toilet; bath mat; bathroom towels; soap. 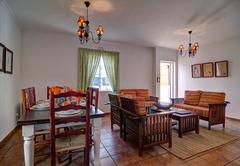 Perfect location, great accomodation and food, very friendly staff and so many things to see!! Response timeDe Hoop Village typically responds to requests in 5-10 minutes.